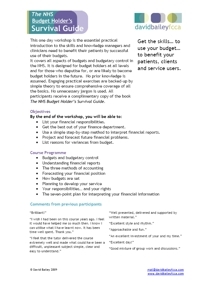 This one day workshop is the essential practical introduction to the skills and knowledge managers and clinicians need to benefit their patients by successful use of their budgets. It covers all aspects of budgets and budgetary control in the NHS. It is designed for budget holders at all levels and for those who deputise for, or are likely to become budget holders in the future. No prior knowledge is assumed. Engaging practical exercises are backed-up by simple theory to ensure comprehensive coverage of all the basics. No unnecessary jargon is used. The seven point plan for interpreting your financial information. All staff who are responsible, or who will shortly be responsible, for a budget. Great course in Derby. I go to a lot of these sorts of training sessions. This session wasn’t remotely dry despite the subject matter. Kept us engaged and interested throughout. Very informative, very well facilitated. Will be recommending to others.